Here is a recent completed renovation that we sold very fast….. before we even had to list it for sale on the MLS!! This is a 4 bedroom 2 full bath cape style home located in Springfield Massachusetts that we did a full rehab on. Improvements included all new plumbing, new electric, all new heating system, brand new kitchen, 2 completely renovated full baths, some new siding. We added some additional square footage by finishing off a rear porch into additional living space. The finished porch is now open to the kitchen and makes a nice dining room. We added a full bath on the second floor to go along with 2 large bedrooms. The team did a great job getting this property fixed up and ready for sale. Here is a link to the photo gallery of the completed home! This one came out great. We used a different color in the bedrooms; it’s more of a grey tone, as opposed to the usual Tan……… I like it. What do you think?? We buy houses in Springfield, MA. Right here; we’ll even show you how we do it. We buy houses in Chicopee, Hoyloke, Agawam and Ludlow MA, no matter how ugly the house is. Ugly is good from a buyer’s point of view. Ugly house is another expression for “this home has potential”. Fixer-upper? Sure, we buy these ugly homes “as-is”, clean them up nice, and sell them for a profit. We buy houses for cash in Springfield, MA, no matter how ugly the house is. 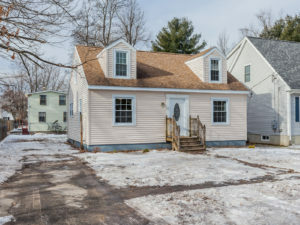 So, if you want to sell your house fast in Springfield, Chicopee, South Hadley or Holyoke, point your browser at HampdenHomebuyers.com, also try our sister site MyHouseSoldNow.com – or, give us a call at 413-248-SELL and sell your house fast, because we pay cash! P.S. Remember, if you like our blog posts you can subscribe using the form in the upper right hand corner under the heading “Subscribe to this Blog” , that way you get an email whenever we make a new exciting, awesome, informative and inspirational post!!!! Playing a little catch-up here. We completed and sold this awesome home on Sunridge Dr in Springfield and I realized I never put up the before photos, or the video that we did of the renovation in progress. So, as the old saying goes, better late than never. Here are the before and after photos for your viewing delight. Be sure to click on the small thumbnail to open up the large gallery photos!!!! Make sure you click on the small photos to open up the larger gallery and get the full experience of this amazing transformation!!!! Well that is quite the transformation!! Here is a sweet video that Dom did during the construction of the home and it’s guest starring one of our contractors! Lots of good information!! Well that does it for this post on Sunridge Dr. The home sold really fast and the new buyers love it!! or you can subscribe in the upper right hand corner under the heading “Subscribe to this Blog” , that way you get an email whenever we make a new exciting, awesome, informative and inspirational post!!!! Why You Should Choose Hampden Homebuyers When Thinking of Selling Your Springfield House "As-Is"
How to Sell your Easthampton House in 1 Day! Need to Sell a Monson House Fast? Need to Sell a Palmer House Fast? Jerryll on Crazy Times in Real Estate + We’re on the News! !